Israeli forces questioned the family of Nizar Sawarkah, who was killed yesterday in Arrabah near Jenin after he stumbled on an unreported landmine in an abandoned Israeli military facility. Palestinian security sources stated that several Israel military vehicles raided the Sawarkah's home town overnight and ransacked the deceased's home. The Sawarkah family was forced into the street while the house was searched, then questioned for three hours in their home. No arrests were reported. Nineteen-year-old Nizar Sawarkah died instantly when he walked over a landmine in an abandoned Israeli military training facility as he walked towards his family fields for a day of farming. Despite the presence of Israeli forces around the village, and the journalists who were barred from entering the area, the protesters from Ni'lin reached the separation wall and performed their Friday prayers on the confiscated lands. In his speech to those praying Skeikh Mohamad Ka'an praised the steadfastness of residents in confronting the Israeli attacks. He said that he wished all sides would take responsibility for the residents of Ni'lin, especially those harmed by the construction of the wall. Friday's rally came one day after the Israeli army attack on the residents during which seven children were injured including Baha' Abu Srur who was hit in the head by a rubber-coated steel bullet. Rezeq Khalil Nafe was also hit by a metal bullet in the chest and underwent a successful surgery in Ramallah hospital. During the demonstration protesters cut the barbed wires installed by the Israeli army which aimed at preventing the protesters from reaching the Israeli bulldozers constructing the wall. Youth from the village placed the cut barbed wire in front of the bulldozers. The Israeli soldiers attacked the residents by firing gas canisters and sound bombs on the youth, three residents suffocated after inhaling gas. The media spokesperson of the Ni'lin popular committee against the wall, Salah Al-Khawajah said "Ni'lin is under daily massacres similar to what happened on Thursday when eleven people including seven children were shot by rubber coated metal bullets." He also told of Israeli troops surrounding the girls secondary school in the village and intimidating them by throwing sound bombs intentionally on residents' homes. These actions, Al-Khawajah said, injured a four year old child, as well as a pregnant mother and her children. Mohammed Jaber Daraghameh was shot in the head with a metal bullet Friday as he participated in a protest march in the village of Bil'in and was transferred to Ash-Sheikh Zayed Hospital in Ramallah for treatment. Several others choked on tear gas after Israeli forces attacked marchers as they neared the site of the construction of the separation wall, and attempted to cross into ancestral village lands. Many members of the Central Committee of the Popular Struggle Front participated in the demonstrators in solidarity with the villagers. 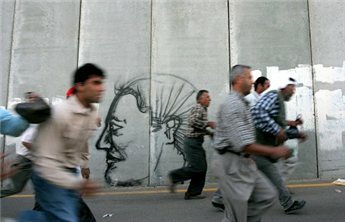 The demonstrators managed to reach the wall and walked along its route chanting slogans against the Israeli soldiers. Shortly after protesters reached the wall, clashes erupted between the demonstrators and Israeli soldiers and soldiers fired rubber-coated metal bullets and tear gas at the demonstrators. The soldiers sprayed the demonstrators with wastewater; many fainted and vomited due to the noxious smell and chemicals. 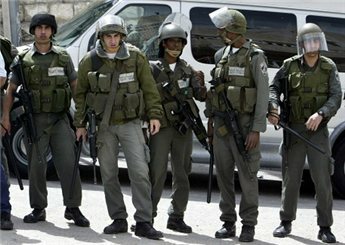 The Israeli army forced their way into the playing field of a Palestinian secondary school in the village of Tell in south west Nablus district on Friday afternoon. Local witnesses told Ma'an that dozens of Israeli soldiers stormed the area where a soccer game was about to be held and arrested 19-year-old Isma'iel Ibrahim Afanah and took him to unknown destination. Afanah had been preparing to play the soccer game for his team in the village, when he was arrested. 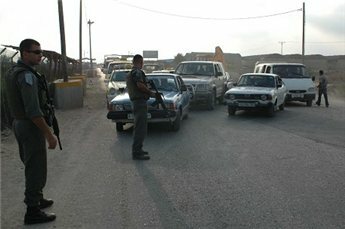 Israeli forces set up a checkpoint at the southern entrance of Qabatiya south Jenin on Friday morning. Local sources reported to Ma'an's Jenin correspondent that a flying checkpoint was established in the area and that the Israeli soldiers manning the post were provoking residents. He said that some were asked to remove their clothes for strip searches, and others were asked to pull down their trousers in front of women. Other cars were pulled over and women were asked to step out, at which point their belongings were searched. Eyewitnesses added that searches were being conducted unnecessarily slowly, causing a pile-up of cars waiting to pass the blockade. 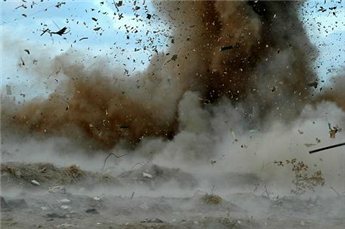 Landmines planted in abandoned Israeli military base in the West Bank killed one man in Arraba south west of Jenin on Friday. The information office for the Palestinian police said 24-year-old Nizar Sawarkah was killed immediately when a landmine exploded beneath the young man. Nizar was transferred to Jenin governmental Hospital, but died of the injuries he sustained. The police report said Nizar was walking in through an abandoned Israeli military base when the incident occurred. Israeli forces seized a Palestinian man and raided a medical center early on Thursday in the West Bank city of Bethlehem city. Palestinian security sources said that an Israeli forces stormed the city and surrounded house of 35-year-old Ala Mohammad Hassan Breijiyyah, detained him, and damaged his house. Meanwhile, Israeli soldiers stormed Al-Ehsan medical center in central Bethlehem city and searched the building. A separate group of Israeli soldiers invaded Ad-Duheisha refugee camp in the south of Bethlehem and raided the house of Ahmad Tawfiq Tayeh, and later withdrew without any arrests. Gaza crossings closed "until further notice"
The Israeli government ordered the demolition on Thursday of a newly built mosque and community center in the unrecognized Bedouin village of Wadi Al-Na'am in the Negev desert of southern Israel. 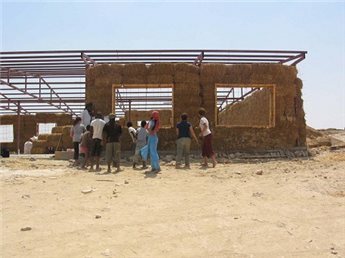 The mosque, which is to double as a community center, was built was built with environmentally sustainable straw bale and mud plaster on a steel frame. Local activist Mahmoud Jarbeau, a Bedouin resident of Wadi Al-Na'am who served for nine years in the Israeli military, oversaw teams of international and Israeli volunteers who built the mosque over the past several months. According to Jarbeau, the mosque cost 70,000 Israeli shekels to build, and if it is destroyed, he and his volunteers will rebuild it. "Despite the difficulty of collecting the money, we will try again," he told Ma'an. Jarbeau said the mosque was designed along the lines of the Mosque of the Prophet Muhammad in Medina, Saudi Arabia. His vision was to build both a place of worship and a center for the preservation of a Bedouin heritage that is increasingly threatened by Israel's policy of forced urbanization. The choice to build the structure with natural materials was based on economic, environmental and strategic concerns. "It's inexpensive and it's sustainable. Sand, clay, water, straw - these are the materials that are available to people here," said Tess Lehrich, an Israeli Jew who has been working with the Beersheva-based Bedouin-rights organization BUSTAN. "Using natural materials is important especially in the unrecognized villages," said Ra'ed Al-Mickawi, the director of BUSTAN. "When they receive a demolition order, they can be rebuilt easily." Last Thursday, witnesses said, civilian-clothed representatives of the Israeli Ministry of the Interior descended on the town, delivering a demolition order for the mosque and several other new structures. As of Sunday afternoon, the demolition squad had not yet arrived. "It's never certain. They never say when they'll come when they issue a demolition order. So, it's a feeling of uncertainty that we're struggling with," said Al-Mickawi. The story of Jarbeau and the mosque is sadly indicative of Israel's policy towards the non-Jewish residents of the Negev. Wadi Al-Na'am, home to an estimated 8,000 Bedouin, is one of 45 unrecognized villages in the Negev. Though they are full Israeli citizens, the 84,000 Bedouin residents of these communities receive virtually no public services. Retroactively rendered 'illegal' by the 1965 Planning and Construction law, the unrecognized villages also face the constant threat of demolition. The international Center on Housing Rights and Evictions (COHRE) reports that 227 demolitions took place in 2007. Earlier this month the nearby village of Twail Abu Jawal was destroyed for the 17th time in three years. According to a report by COHRE and BUSTAN, "the inhabitants of the unrecognized villages are not granted a license to build any structures and cannot be connected to any basic services or facilities such as water, sewerage, electricity or telephone networks, services that other Israeli citizens take for granted." Wadi Al-Na'am itself is sandwiched between Ramat Hovav, a massive industrial complex of 19 chemical processing plants and a hazardous waste treatment plant. Also nearby is a large power plant that supplies power exclusively to the recognized, Jewish settlements in the region, completely bypassing the Bedouin town. While the Negev is home to some of the wealthiest Jewish communities in Israel, the residents of Wadi Al-Na'am are workers in the chemical plant and goat herders. Others collect scrap metal to sell, or rely on government social benefits. While they make up 25% of the population of the Negev, they own less and 2% of the land, say COHRE and BUSTAN. The only alternative available to the Bedouin is relocation to government authorized townships, urban communities, where by definition the Bedouin are forced to leave their ancestral lands and give up their traditional way of life. The fate of the Wadi Al-Na'am mosque is for now uncertain. Aside from plans to rebuild, Jarbeau says he plans to appeal to Ghaleb Majadele, the only Arab member of the Israeli cabinet. Neither Jarbeau nor BUSTAN have any concrete plans for a legal challenge. Israeli police and Shin Bet (General Security) officers stormed the Al-Aqsa Foundation for the Reconstruction of Islamic Holy Places office in Umm el Fahm on Saturday night. The order to close the Foundation was issued by Israeli Defense Minister Ehud Barak, on what was claimed to be "information received on ties between institution and Hamas headquarters in Jerusalem." The office of the Foundation, in Israel was raided on Saturday night and ransacked; the safe was removed as well as cash, and documents. On Friday the Foundation issued a statement accusing extremist Israeli settlers in Jerusalem of defiling more than 20 ancient tombstones in the Ma'man Allah cemetery just outside the Old City of Jerusalem on Thursday. The cemetery, according to the Foundation, is the oldest and largest cemetery in the region. According to studies a number of the Companions of the Prophet Muhammad, scholars and imams from the seventh century AD are buried at the site. 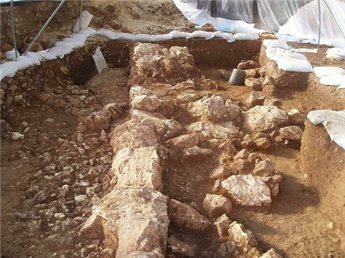 The Foundation threatened to prosecute those responsible for the vandalism, saying that they held Israel fully responsible for the damage to the ancient site. The statement also said Israel prevented the Al-Aqsa Foundation from fixing the disturbed graves. Later Friday the Foundation's leader, Sheikh Raed Salah delivered a speech denouncing what he called the "Israeli policy of destroying Islamic Jerusalem." On Sunday several of the Foundation's bank accounts were frozen. Israeli media has reported that the material taken from the offices will be handed over to the Shin Bet, which will determine whether or not an investigation will be launched. The investigation is said to be focusing on the financial statements of the Foundation, which is being accused of giving funds to Hamas through joint activities held between the two organizations. Zahi Nujidat, a spokesman for the Islamic Movement's northern branch, was quoted as saying that the Israeli raid of the institution was because it had "no answer" to the accusations of the Foundation that Israel had caused immeasurable damage "to the holy sites in general and to the al-Aqsa Mosque in particular." Hatem Abdel Qader, the Palestinian President's advisor on Jerusalem affairs condemned the Israeli government's shutdown of the Al-Aqsa institution in the Israeli town of Umm Al-Fahm a "racist and stupid" action. The organization's headquarters were raided by Israeli forces on Sunday morning after the Israeli government accused the group of ties to Hamas. Abdel Qader praised the group's role in exposing Israel's plans to "Judaize the Al-Aqsa mosque." The organization was founded to defend the iconic Jerusalem mosque in from nearby construction and excavation. Abdel Qader extended his support to Sheikh Ra'ed Salah, the head of Islamic Movement in Israel and to staff of the institution for their work in defending institutions. The Islamic Movement's own offices were also raided on Sunday morning. A Palestinian man shot by his Israeli employer last week died Saturday of his wounds. The man, from Yatta south of Hebron in the West Bank, was working in Tayiba, south of Lake Tiberias in Israel, on an agricultural farm. The family of the young man, 18-year-old Ansar Abu Tabeikh, told Ma'an that a fight erupted Wednesday between Abu Tabeikh and his Israeli employer who took his gun and fired at the man. Fellow workers transferred Abu Tabeikh to hospital at Kfar Saba north of Tel Aviv where medical sources described his wounds as serious. According to one Abu Tabeikh's colleagues, the employer asked his workers, including Abu Tabeikh to spray chemicals on figs trees on Tuesday afternoon so they would be ripe the following day and be ready for harvest. It seems the workers did not dilute the chemical enough by mistake, and the crops were spoiled when they returned to the fields on Wednesday. When the employer came in the morning, a fight erupted between him and the workers, which resulted in the man opening fire on Abu Tabeikh. The family said they would receive the corpse on Sunday to be buried in his home town of Yatta. The family said they knew nothing about whether the employer would be charged with the death of their son, saying that since the crime occurred in Israel, there is little they can do about ensuring justice is served. Residents of the village of Ni'lin west of Ramallah prayed on their lands that have been confiscated for the construction of the separation wall on Friday. The Popular Committee Against the Wall headed a peaceful demonstration to the site of the construction wall. Each week residents and activists attempt to reach the confiscated areas, and are generally stopped by Israeli soldiers guarding the area. After the Friday prayers Palestinian youth closed the roads that the Israeli army opened for the construction of the wall. Though Israeli soldiers who were already at the site of the wall told protesters that the area was a closed military zone. Soldiers used sound bombs and called for additional troops in order to surround the group of protesters. The clashes erupted. Israeli soldiers chases Palestinian youth to the entrance of the village and fired gas bombs on them. Soldiers installed road blocks at the entrances of the village closing it and preventing international peace activists from entering; turning back a Spanish delegation of fifteen people. A German crew who meant to cover the event in Ni'lin was prevented from entering the village and were detained for hours outside the village by the Israeli army. Dozens of demonstrators choked on tear gas Friday as Israeli soldiers attacked a peaceful demonstration in the village of Bil'in west of Ramallah. After the Friday prayers, residents of Bili'n joined by international peace activists rallied in the center of town then took to the streets carrying Palestinian flags and banners with slogans printed on them denouncing the construction of the separation wall, land confiscation, settlement expansion, the siege of the cities and killing of civilians. They also chanted slogans calling for national unity. The demonstrators marched to the sire of the construction of the separation wall and tried to pass through to their lands on the other side. They managed to reach to the site of the wall, but were stopped by soldiers throwing sound and gas bombs, and firing rubber coated metal bullets. The soldiers also showered the demonstrators with waste water and chemicals. Dozens vomited after being soaked by the polluted water. The Israeli army detained dozens of Israeli peace activists participating in the march and prevented them from reaching the village where they were chased into the nearby fields. Also on Friday a group of Israeli settlers attacked for the third time the house built by the Popular Committee Against the Wall three years ago. They ransacked its contents and then set fire to it. The settlement near Bil'in is looking to expand and settlers are trying to drive residents out of the village by constant harassment. Israeli soldiers attacked a non violent demonstration against the illegal separation wall in the village of Al-Ma'sarah near the West bank city of Bethlehem on Friday. Residents of the village were joined by activists from the Palestinian National Initiative, the Palestinian Struggle Front and Israeli and international peace activists. The coordinator of the Popular Campaign Against the Aall, Mazen Al-Aza, said that Friday's "rally commemorated the 39th anniversary of the burning the Al-Aqsa mosque and denounces Israeli expansion policies." Al-Aza added that Israeli soldiers prevented the rally from reaching the lands that are to be confiscated for construction of the wall, and fired live rounds of ammunition and sound bombs. The Popular committee said that the road closed down earlier Friday in the town of Al-Walaja will be reopened by force next week. The action will be a collective one showing the rejection of Israeli policies by local Palestinians. Radical settlers damaged 20 graves and tombstones in Ma'man Allah cemetery just outside the Old City of Jerusalem on Thursday. Damage to the cemetery was concentrated in four different areas, and reports say that the vandalism was done over the course of several days. In a statement sent to Ma'an the Al-Aqsa Foundation for the Reconstruction of Islamic Holy Places said that they had collected information indicating extremist settler involvement in the destruction and desecration of the cemetery. The Foundation is currently threatening to prosecute those responsible for the vandalism, saying that they hold Israel fully responsible for the damage to the ancient site. The statement also said Israel has so far prevented the Al-Aqsa Foundation from fixing the disturbed graves.